I awoke at 6am to the sound of Joanna cooking. I was in for another truly home cooked meal. I had set my alarm for 6:30 as I had gone to bed at 1, but since I was up I stretched my ankles and got out of bed. I had a fast soft cool shower before my host, Michal, got up so I didn’t encroach on his getting-ready-for-work time. Cool, because I try to minimize what I cost my hosts. Interestingly, Michal’s Warsaw home (a condo building) doesn’t have a hot water heater. Maybe no one in Warsaw does. Michal explained that water is heated in a tower and piped into each home. Rather than heat their own water, they purchase hot water. That’s all hot water. For showers, faucets, and laundry. As Michal was out walking his dog, Maya, Joanna and I had another good conversation and I presented her with a thank you gift I thought was perfect for her. Today was the day for me to go to Krakow. My friend Dorota, a Polish woman I’d met in Austin, will meet me at the Krakow bus station at 1:00. Last night he’d helped me purchase my ticket online. It was 45PLN, aka złoty (zwar•teh) or $14.67. I was leaving Michal and Joanna’s home with an invitation to return any time during my visit to Poland. That’s one of the best compliments a traveler such as myself can receive and it was a great feeling to be invited back by this terrific couple. Michal dropped me off at the bus station on his way to work. Actually, he parked and saw me to exactly where the bus would come. My view of my first PolskiBus from my original seat. 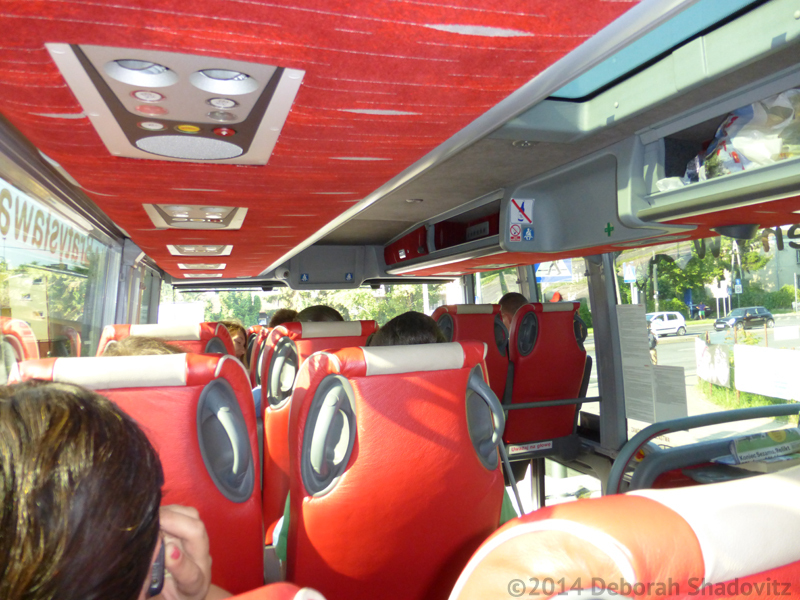 At 8am I was on that bus — my first Polish bus, PolskiBus. It was a very new-seeming, beautiful double-decker. Each clean red high back seat has a seatbelt. I had a window seat on the upper level, thanks to a nice Polish-speaking woman. (English is not always necessary for communication.) However, I am in only in the middle. I will have some views but not the views I wanted as that requires being in the front. Bummer because I love taking photos to share with friends and potential travelers. This will be a ride of window gazing, journal writing and composing emails to friends. With free wi-fi, I can actually send the emails too. I don’t have a Polish SIM card yet as I didn’t need a phone while with my first host. At 10:45 I got a seat upgrade. The bus stopped to let people off and on, giving us a 15-minute break, my seatmate informed me. A couple perhaps in their early 70s was in the two side-by-side seats across the aisle. Their seats fronted to stairs rather than another tall seatback as mine did so my seatmate helped me to take their seats as they departed. This was quite comfortable: leg room and a huge right side window area. The view in front is still only backs of seats, but that’s ok. In my new more spacious seat, I took out my food bag and hung it from the cup holder and shelf in front of the seat. (No other seats had this.) I stashed my red ChicoBag daypack up on the shelf. 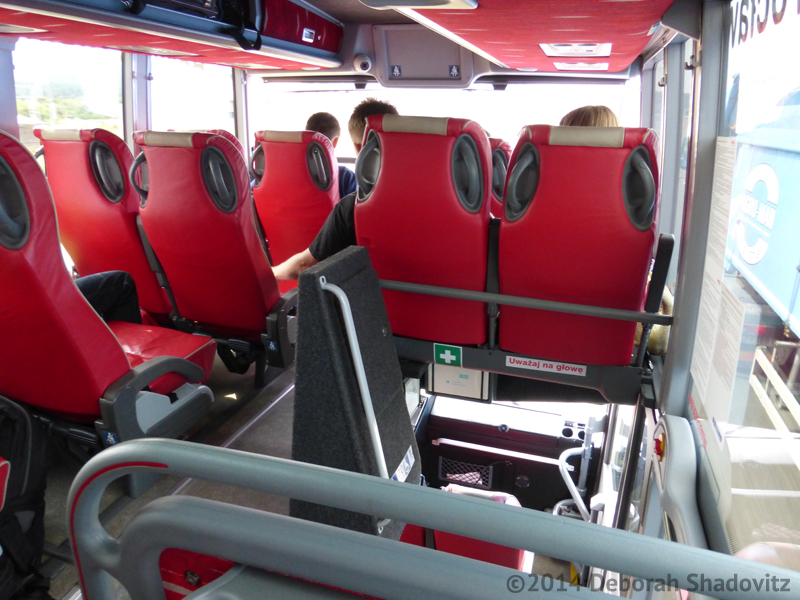 If you’d like to come along with me for the ride, here are 21 photos of my approximately 3-hour bus ride from Warsaw to Krakow starting as soon as we are out of the city. Below them, I share my journal description, written in Apple’s Notes on my iPhone as I rode. 11:15am: We are still on the same type of highway that has come and gone during this trip. One lane in each direction. Here it is not brand new smooth. I feel the road vibrations and some bumps, but not pot holes. The road is of gentle hills. Mostly there are tall green trees on each side – except where there are breaks of homes. Each time I think to pick up my camera, we get to a house/farm/town break. Now it’s farm-ish; I just looked up to see a single black cow alone in a large green field. We just picked up speed and standing in my seat I could see we had entered a two land per direction highway again. The sign says s7 Krakow. I think that is this road. 11:50: We are In farm country now. Have been for a while. Open fields of hay and green. A home here and there. Then a cluster of 10 or so homes. And now our road is another small Main Street. Old fashioned but not brownstone. And now still one lane, but farms and high hills and trees on either side of us. The grass here is green. Not drought or sun-stressed brown as it is back home. It’s 11:57 and our road is a Main Street again. It seems towns are every 5-10 minutes apart. Suddenly, the female voice on the bus was announcing we were arriving at the Krakow bus station. It really caught me by surprise. I was prepared to spend hours more looking at the scenery. I pulled my two bags down from the overhead shelf, put my stuff together and was the second person out of the bus. Sitting where I was, I would have been first but a rude 20ish guy jumped in front of me, shocking me as he did. I got my bag from check-in under the bus fairly quickly and walked to the metal rail along the sidewalk’s side. Putting the bag atop the fence (not without with some difficulty), I was able to get it onto my back and buckle it into place. I wandered around the station a bit wondering where Dorota might choose to wait for me. I didn’t see her out on the bus island, so I went into the ticketing area and then to the waiting area seats. When a seat opened up I sat down and put my pack beside me, the rest at my feet. I figured she’d walk around and find me. And she did. I had waited perhaps 15 minutes. I really didn’t check the time as it didn’t matter at all. Travel tip: When you arrange to meet someone at a train or bus station, decide whether you’ll meet where the bus lets you off, or inside the station at some landmark, or at some other specific location. It’ll save you a lot of time and potentially, worry. Ready for my first Krakow visit. 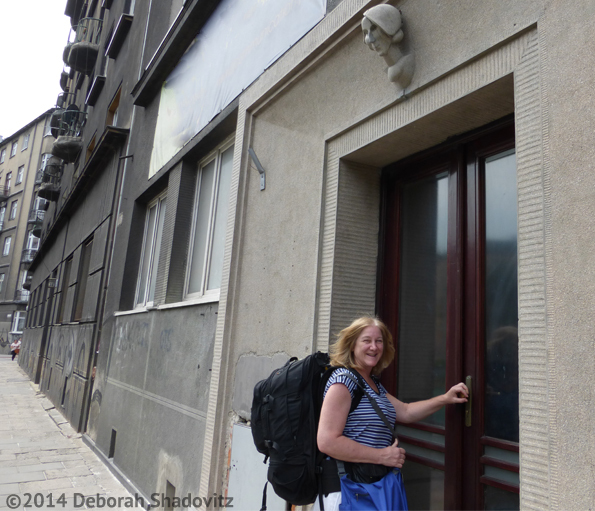 Outside of the Krakow bus station, we took a bus, then very short walk, and I arrived at my first visit to a Krakow home.